Looking for Ben Barsi’s story? It’s here! Have you been wondering what happened to Gisella and Rozalia’s cousin Ben? Do you want to know who betrayed him and how he recovered from nearly ruining his whole family? I’m so excited to tell you his story, Innocent’s Pregnancy Revelation, will begin posting as a serialized, free online read at Harlequin.com today. When I wrote the first book in my Barsi on Fifth duet, A Virgin to Redeem the Billionaire, I needed Kaine to have a grudge against Gisella’s family. Along came Henriqua, a very beautiful geologist. I don’t want to give too much away, but there is a revelation of a pregnancy by an innocent in this story. NOTE: This romance is serialized and will post one chapter each weekday from April 22-May 17th. 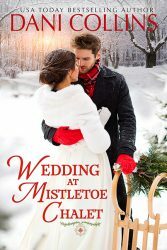 You’ll have to set up an account at Harlequin.com to read it, but it is completely free to read once you log in. Enjoy! My week has started with a cover for the UK version of The Maid’s Spanish Secret. Doesn’t Rico look suitably salty about past betrayals? He is very dismayed. And when he learns that not only did his now dead wife cheat on him and use him, the one woman who had seemed a sweet light in an otherwise dark life kept his child from him. Poppy felt used herself. Rico’s engagement had shattered like the priceless vase his fiancee had smashed as she left him. She and Rico had been commiserating and one thing led to another, but by the time she realized was pregnant, he was married. She’s been thinking about tell him, but had good reasons to put it off. When he shows up on her doorstep, however, everything changes. The Maid’s Spanish Secret comes out in August, but if you happen to be suffering the Monday Morning Blues and need something to distract you at your desk… Start reading here. Happy Tuesday! I just caught a glimpse of Poppy and Rico from The Maid’s Spanish Secret and it’s so sweet and tender. I love it! Fun Fact: Poppy is Canadian. She’s on holiday in Spain when she winds up robbed and broke. She goes to work in Rico’s parents’ mansion and, on her last day of work, has a tryst with the spare, Rico. His engagement has just ended and Poppy is finally heading back to Canada–but #spoileralert–she unknowingly carries a souvenir of their encounter. For sweet maid Poppy Harris, her one and only passionate experience was scorching and absolutely forbidden. She shouldn’t have succumbed to Spanish aristocrat Rico Montero’s tantalizing seduction, but his touch was all consuming…and had a nine-month consequence! Poppy believes they could never be anything more. Until Rico appears on her doorstep demanding his hidden daughter—and determined to make Poppy his wife! This marriage of convenience is a roller-coaster and has one of the most dramatic endings I’ve ever written. I hope you love it! Innocent’s Nine-Month Scandal Releases Today! Rozi heads to Budapest in search of her grandmother’s heirloom earring only to wind up in billionaire Viktor’s arms. He’s the rightful owner of the earring–or so he thinks. Soon the earring is stolen, family secrets are out of the closet, and a baby is on the way. Can this lost pair ever be united? Fun Fact: Innocent’s Nine-Month Scandal is Book Two in my lost earring (Barsi on Fifth) duet. If you missed the first book, it’s called A Virgin to Redeem the Billionaire. Another Fun Fact: this duet has three stories! Watch for Ben Barsi’s romance in Innocent’s Pregnancy Revelation, coming Apr 22 as a free online read at Harlequin.com. If you want me to email you the link when Innocent’s Pregnancy Revelation goes live, subscribe to Site News or my Dear Reader newsletter. Waking to a new cover is *the best*. This is the UK version of Untouched Until Her Ultra-Rich Husband. What does ‘ultra’ rich entail? Well, take your average billionaire and make him the world’s first trillionaire and you have Gabriel Dean, a man so over-the-top wealthy he has a super sonic jet in his fleet of air travel options. When he inherits his grandmother’s fortune, he also inherits Luli, a destitute assistant who is soon swept up in his world. Enjoy the ride with her! And what do you think of this gorgeous cover? I always love it when they use the art from the North American version. Sometimes reading is harder than math…. Since today is the official release day for A Virgin to Redeem the Billionaire my wee brain got confused and I made the graphic with the wrong cover. Derp. I managed to get a shelfie with A Virgin to Redeem the Billionaire thanks to my local Pharmasave. If you haven’t found Kaine and Gisella on a shelf near you, I hope A Virgin to Redeem the Billionaire is arriving promptly on your eReader today. If not, your buy links to download today are here. A quite enjoyable twist of two favourite tropes: the vengeful H and the fake engagement. I can’t wait to read Innocent’s Nine-Month Scandal, because cousin Rozi seems so cute and endearing while Viktor is an intriguing and mysterious hottie Hungarian H.
I can’t wait for you to read their story, either! Good news, if you’re anxious to get your hands on Rozi and Viktor, they’re available to download today on Harlequin and Mills & Boon UK. Innocent’s Nine-Month Scandal releases on all digital platforms April 1st (no foolin’!) You can read an excerpt here or pre-order here. Look for A Virgin to Redeem the Billionaire on shelves now! I’ve been haunting our local shops, hoping to take a selfie with A Virgin to Redeem the Billionaire but half the time I’m fresh from the gym–not ready for my close-up. The rest of the time, I’m shovelling my driveway and skipping the gym, not leaving the house at all. Perhaps I’ll have better luck if I ask you, Dear Reader, to take a shelfie with Kaine and Gisella from A Virgin to Redeem the Billionaire and tag me with it on social media? It should be out in the wild by now. 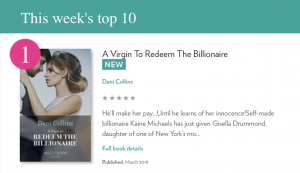 I popped onto the Mills & Boon site to make sure A Virgin to Redeem the Billionaire was available so I could give you the link for early purchase. To what did my wondering eyes did appear? 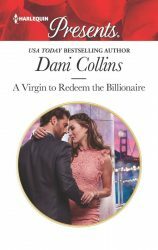 A Virgin to Redeem the Billionaire is #1! I’m thrilled so many readers are eager to get a jump on this duet about a pair of jewelry-designing cousins who are obsessed with recovering their grandmother’s heirloom earrings. In this first one, Gisella loses the earring to Kaine at an auction. He has a score to settle with her family and holds it for ransom, determined Gisella risk the family reputation to even things up. Their sexual tension is off the charts. What will happen when he discovers she’s completely innocent? 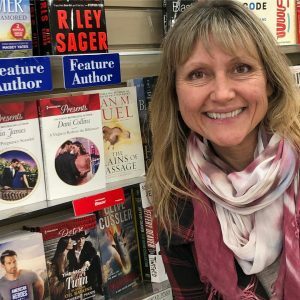 Fun fact: There will be a free bonus story on Harlequin.com later this spring about a third cousin, Ben, called Innocent’s Pregnancy Revelation. Stay tuned here or join my Dear Reader newsletter. I’ll send you the link when it goes live. If you haven’t yet downloaded this one, you can get it now directly from Harlequin or Mills & Boon UK now. A Virgin to Redeem the Billionaire will be available on all the usual digital retailers on March 1st. Pre-Order are here. Thank you again! You’re the best! 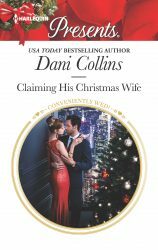 A Dani Collins happily ever after may take you into high society parties, small-town supper tables, or to posh resorts where the jetsetting elite play. High-intensity drama and richly emotional, sensual storytelling. This is romance at its best! After submitting, be on the lookout for a confirmation email. If you don’t see it soon, check your spam folder.